It’s important to remember that the Irvine Open Space Preserve is a natural wilderness area home to rare and endangered plants and animals. Naturally-occurring conditions (e.g., heavy rains or Santa Ana winds), behavioral changes within animal populations (e.g., raptors nesting), and anthropogenic conditions (e.g., social trails through sensitive habitat) may require the City to restrict public access or activities. During your visit to the open space preserve, please pay attention to informational signs, stay on trail, and respect barriers such as gates. You may also encounter City of Irvine staff, Irvine Ranch Conservancy naturalists and Irvine Open Space Patrol officers; please follow their guidance, as they are present to protect both you and the land. Violation of the rules may earn you a citation. Designated trails on the Irvine Open Space Preserve (e.g., Quail Hill Loop Trail and Bommer Canyon) are open daily from dawn to dusk. Please note that the hours of operation for nearby public parking may differ. Other trails (e.g., those in Orchard Hills) are accessible during docent-led activities. To best plan your visit to the open space, please visit letsgooutside.org/explore/iosp. Visitors are advised that the Irvine Open Space Preserve is land in its natural condition, and that certain risks such as wildlife (e.g., rattlesnakes, bees, and coyotes) and slippery or rough trail conditions may exist in the area. Wildlife (both plants and animals) is to be protected. No wildlife should be fed, approached, harmed or disturbed. 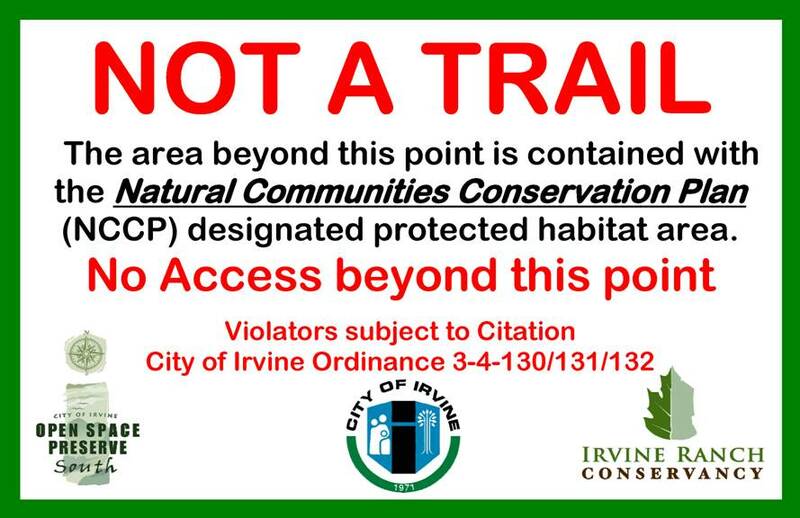 Activities likely to degrade, impede, disrupt or cause irreversible harm to the Irvine Open Space Preserve’s protected habitat will not be allowed. No pets are allowed in the Irvine Open Space Preserve, with the exception of Quail Hill Loop, which allows dogs on a leash. No smoking is permitted in the Irvine Open Space Preserve, whether in vehicles or on foot. Visitors are required to do everything possible to prevent fires from occurring. Vehicles equipped with catalytic converter exhaust systems must be kept on paved roads only and may not be parked near or over tall grass. Access to any area may be restricted by the City during fire hazard events such as those caused by Santa Ana wind conditions. Notification shall occur 48 hours in advance or at the earliest possible time of available communication. Access to any area may be restricted by the City after heavy rains. Notification shall occur 48 hours in advance or at the earliest possible time of available communication. Depending on the type of event planned, the potential impact to the surrounding habitat, and the ability of the visitor to meet City requirements, the maximum allowable group size may be increased or decreased at the discretion of the Director of Community Services. Access permits are required for certain groups or activities. View the City’s Public Facilities Reservation and Fee Policies. View the City’s Municipal Code sections pertaining to the Irvine Open Space Preserve (type “Open Space” in search field; the specific code is Sec. 3-4-128 through Sec. 3-4-139).